The Dobson pendant light by Tech Lighting is sleek and ultra-modern with its cylindrical glass shade and illuminated ring of pure optic crystal. 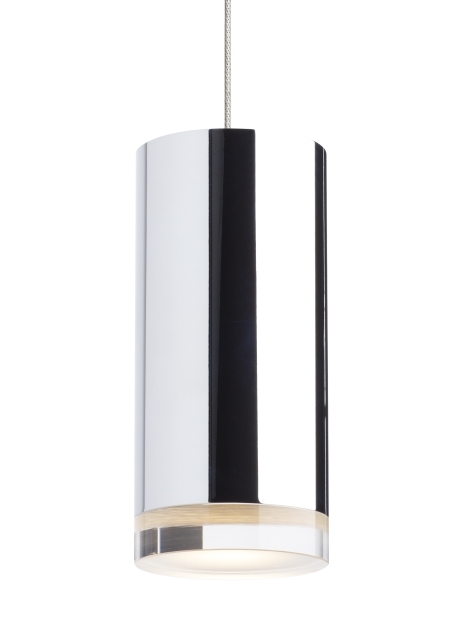 Your choice of sleek chrome or ultra-modern matte black further enhance the contemporary style of the Dobson pendant. The Dobson scales at 5.3” in height and 2” in width making it ideal for kitchen island task lighting, home office lighting and bedroom lighting. This new addition is welcomed into the Dobson family, simply search for the Dobson pendant to find its closest relatives. No Lamp rated for (1) 8 watt max. MR16 LED (Not Included). LED includes 12 volt 8 watt, 310 delivered lumen, 3000K, replaceable SORAA LED MR16 lamp. Dimmable with low-voltage electronic or magnetic dimmer (base on transformer). Ships with six feet of field cuttable cable.